With spring in full swing and summer just around the corner, it’s time to get the outside of your home ready. Front yards, back yards, patios and sidewalks need care and attention after the cold winter months. Hursh’s Landscaping, Inc. is ready to help. Located in Emmaus, Hursh’s specializes in both hard and soft landscaping and boasts 22 years of professional experience. The dynamic duo of owners Brian and Shawn Marie Hursh, along with 50 experienced employees, make up Hursh’s Landscaping, Inc. With Shawn Marie’s business background and Brian’s work ethic, what began as a simple lawn-mowing business back in the early 1990s has evolved into a full-service and year-round enterprise. It’s important to pay attention to the outside of your property and the landscaping around it. Walk around the outside, and take notice of plants and trees. There may be vegetation there for 20-plus years that has outgrown its use. Tip: When mulching, prevent mold growth by not going deeper than one and a half to two inches. Transforming your outside property can make a big difference not only in your home’s value, but also in curb appeal. It will actually create an outdoor-living space that may not have looked so inviting before. Or, perhaps it’s time to update that outdoor living area. Fire pits, built-in grills and outdoor climbing herb walls are some of the “must have’s” on client wish lists. 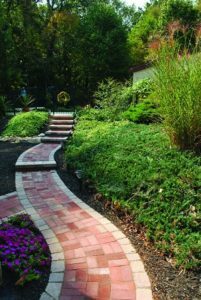 Walkways, stairs, middle and lower patios, refurbishing concrete slabs and installing proper outdoor lighting are also popular, and Hursh’s offers a five-year warranty with all of their craftsmanship, something not common among other landscaping and hardscaping businesses. Larger outdoor transformations can be done in stages each year, thus making projects more obtainable and more affordable. Crew leaders Scott Hagmann (16-year employee) and Chris Skumpija (eight-year employee) will help you envision your project with a three-dimensional design and work with you every step of the way, making knowledgeable suggestions based on their professional experience. Horticulturist and designer Andrew Roth will bring your hardscape and landscape together with his vast knowledge of plants and what grows best in specific areas. By listening to the needs of each client, the team develops a working plan, paying attention to detail and seeing the job through to the beautiful finished product that will have clients spending more time outdoors than they ever imagined. Most of Hursh’s hardscaping clients are based on referrals. Some come from re-installing a job that was not completed properly. 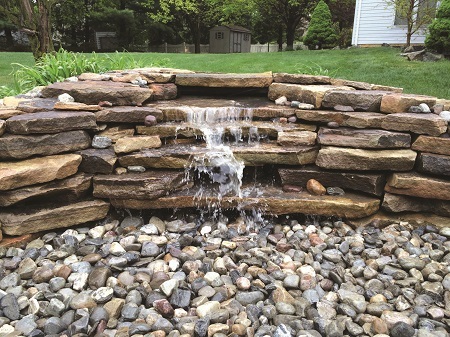 Hursh’s won the Lehigh Valley Builder’s Association award for hardscaping up to $20,000 in both 2013 and 2014. Aside from individual residences, they also provide year-round service for many 55-plus communities. Mulching, fertilizing, edging, mowing, spring and fall pruning and snow removal are all services they can provide. With a client base of approximately 50 properties per year, it’s not difficult to see why Hursh’s Landscaping, Inc. is so popular.